Welcome to the Gears of War Community Spotlight, our bi-weekly blog that dives into how some of the Gears community's most talented creators, fans and contributors craft their amazing work! This week we're talking to Pax112, a talented fan-artist who draws both existing and original characters for the Gearsiverse. Read on for tips and insight into his process for creating his unique take on characters set in the Gearsiverse. Favorite Gears Game: All of them! Favorite character: They are all great, but I always tend to play as a COG or a Carmine. TC: Hi there Pax! Tell us a little bit about yourself and your Gears of War background. Dexter: Aloha! Ever since I was a child I was always into art. I remember getting yelled at by my Mom for drawing on the walls with crayons. As I got older, I tried to immerse myself in drawing and painting everyday. Back then there were no computers, video games, or internet - we only had arcades (man my age is showing..), grabbing any quarters I could find and playing old school games like Asteroids and Pacman. And as much as I loved playing the games, I always found myself admiring the art work on the sides and front of the cabinets. So as my education grew, so did my desire to be an artist. I graduated from The University of the Arts in Philadelphia and have been working on my career ever since. That’s the beauty of art, you are learning every day no matter how long you have been doing it or your skill level. I had pretty much every gaming console, growing up. From Atari 2600, Intellivision, to Nintendo 64. One day I was walking in to a gaming store, and they had a Gears of War promo playing on the screens. From that day, I was hooked. I had never seen anything like that before. The graphics were amazing and the characters were awesome! I asked the person working the desk what that was, and I put money down to pre-order the game and I bought an XBOX 360 that day. Ever since, I have been obsessed for the Gears of War franchise. Every game gets better and better, and I can’t wait for Gears of War 4! 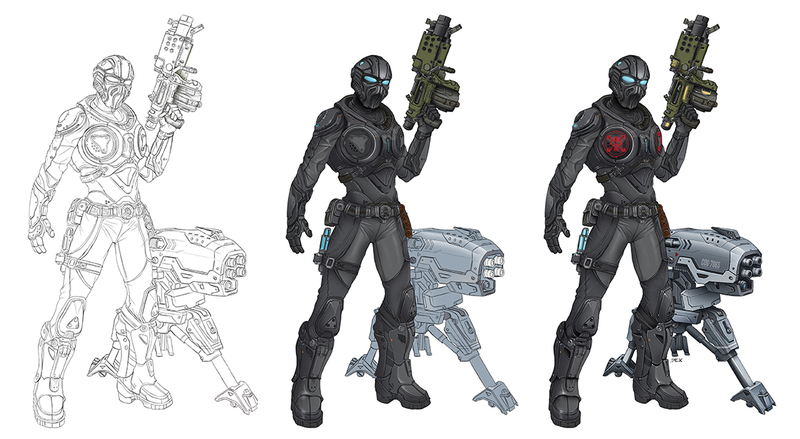 TC: Describe the typical process that goes into creating a piece of your Gears of War artwork. Dexter: Most of my inspiration comes from playing the games and reading the novels. 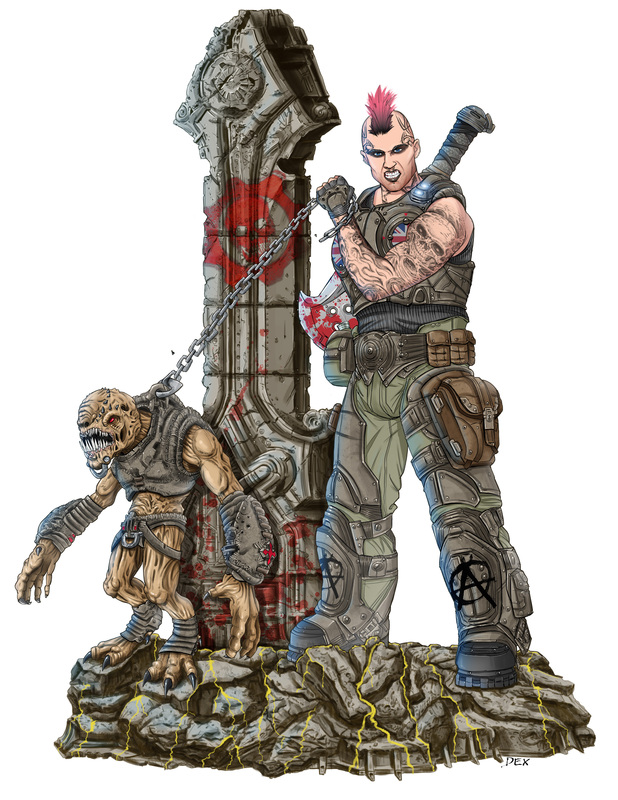 I always imagine other characters and stories that live in the Gears of War universe. I try to tell a story in my illustrations and I’m obsessed with the fine details. If you look hard enough in my pieces, you will find little things here and there that go beyond the artwork. 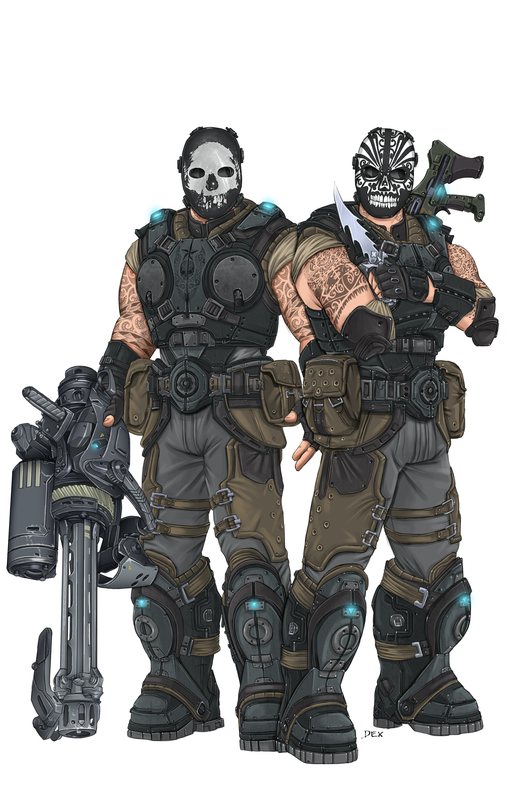 TC: Your art style is really unique for Gears fan-art. How did you find that style and what techniques do you use to achieve it? Dexter: Every good illustration starts with a good drawing. So I gather up as much reference and color schemes as I can. Then sketch out my design and finalize the sketch. Then start laying down color flats, starting with background working to the foreground. I usually break down my coloring into 3 parts - I have my flats, darks, and lights. I work with them first and then add all the details and lighting effects, then the very last step is the highlights. 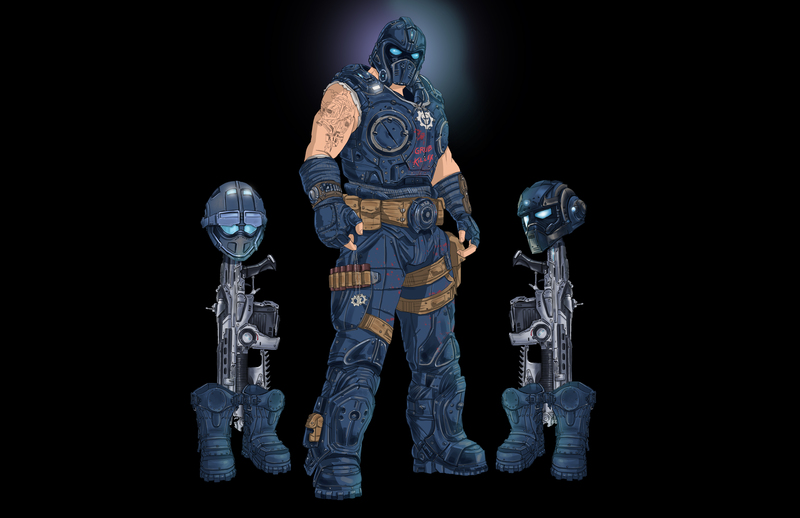 TC: You specialize in characters in the Gears world. What advice would you give anyone who wants to really capture the feel of a Gears of War character? Dexter: Play the games and get inspired by art. The internet is full of talented and creative artists. Also “Art of” books are great too - especially the Art of Gears of War!! I have many “Art of” video games books that inspire me to become a better artist. 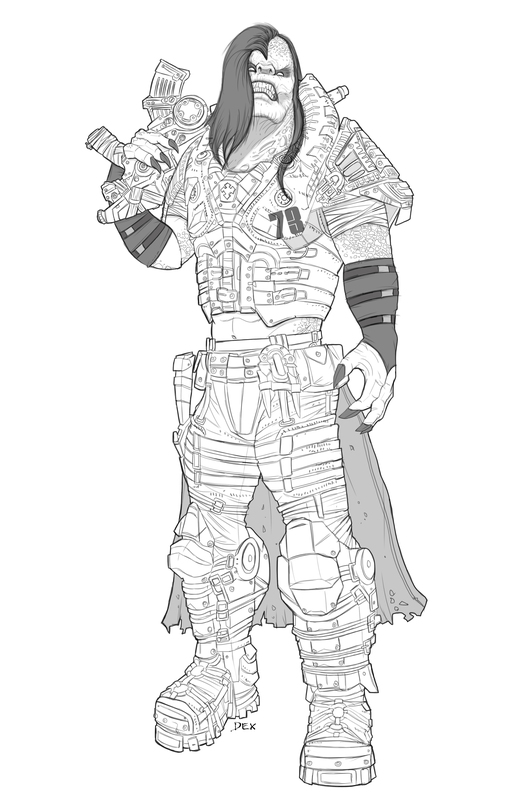 TC: Adding to that, you’ve also conceptualized your own characters for the Gearsiverse (which is awesome by the way!). How does the process differ for a character you’ve created, and how do you ensure they still feel ripped from the Gears universe? 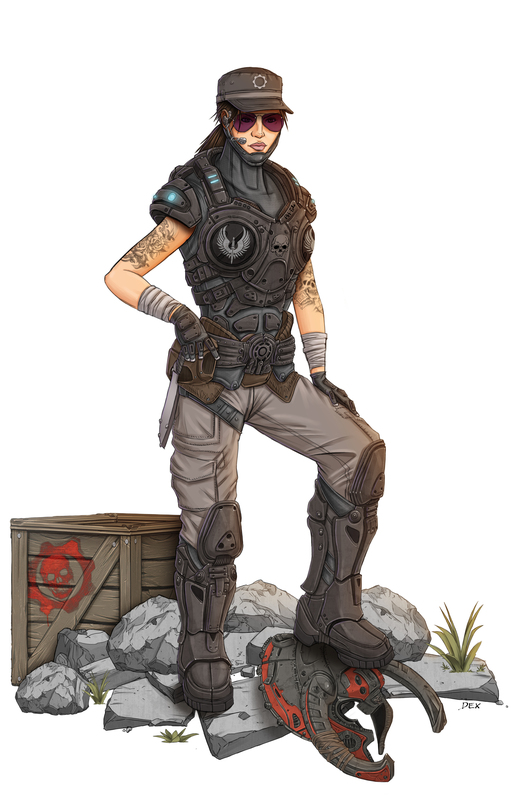 Dexter: I want to make sure that I utilize what exists in the Gears of War universe, such as weapons, armor, etc but make the character my own by adding my own touches such as body language, tattoos, etc. But the most important is the atmosphere that each character is set in. TC: What was it about Gears of War that inspired you to become such a dedicated artist for the Gears universe? Dexter: I have to admit, that it was always the armor from the Cog to the Locust. I love the attention to detail and the way that each character had his\her own style and personality to them. I just want to keep that going in my designs. 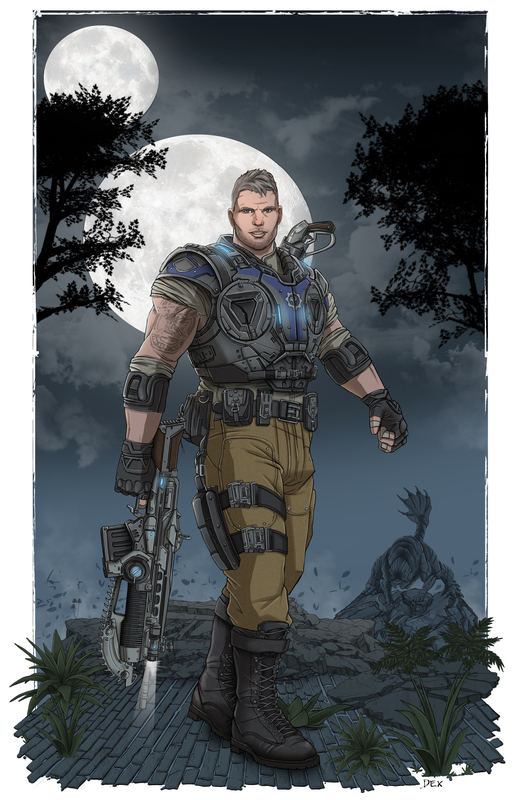 TC: Could you share any tips for any budding artists looking to produce their own Gears of War fanart? Dexter: Draw every day, and always be inspired by other artists and the world around you. Do your research, and study the Gears of War Universe. Also go out and network, you never know who you are gonna meet. Conventions are a great place to meet not only great artists but people in the industry. TC: Thanks Dexter for your great insight into your unique creations! 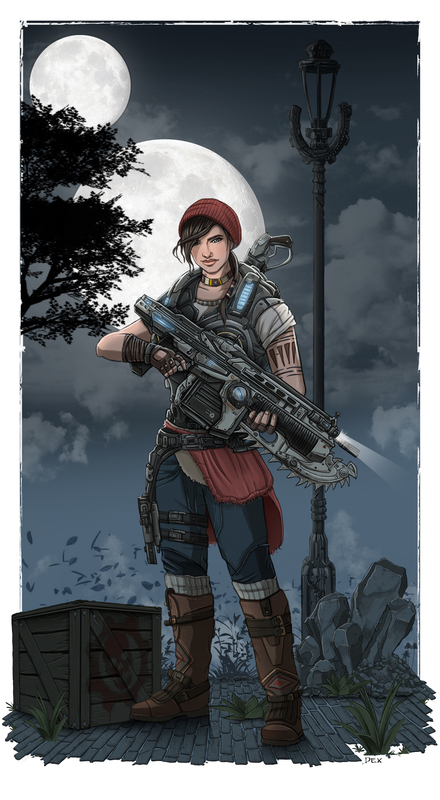 Are you a Gears of War fan-artist? Tweet us your work at @CoalitionGears for the chance to be featured on a future Community Spotlight. Until next time Gears fans.